Ask fellow campers about "Glenview RV Campground" and nearby attractions. Small CG with spaces close together, grass pads, gravel roads. A good many seasonals. Clean and tidy campsites. For us it was all about the location to disconnect the car and drive the Cabot Trail. Owners, staff were very nice. I did not have Canadian coins for laundry. There is a pool which looked clean. I walked the pups up the road out of the park in a nearby subdivision. We camped at Glenview RV Campground in a Motorhome. Alexander Graham Bell Museum in Baddeck is worthwhile. Drove the Cabot Trail and were glad we did not drive the motorhome. It would have been difficult to stop at shops and restaurants and the steep hills and sharp turns would have been stressful for us. Only saw a couple of big rigs on the Trail. It is beautiful and scenic for sure. Need Canadian coins to do laundry. This was a good campground! Should not have a poor rating. Restrooms, and showers. Real nice playground for kids, nice pool. I would surely stop here again. We camped at Glenview RV Campground in a Travel Trailer. thanks for the review, we have significantly changed much of the campground in the last year or so....riverside sites etc, we have now opened up a further 7 acres at the lower level, hence ''GLEN view'' by SKYE RIVER, with 1500ft of frontage.....as close to paradise as you can get....!!!!! Little pricey but not a lot available in area. Quiet and clean. Manager friendly and accommodating. Wifi spotty at times, quiet and quite a few seasonal campers, friendly though. Would stay here again. We camped at Glenview RV Campground in a Motorhome. Not a lot to do but Tim Hortons is close. Thanks for the review, we are expanding the campground quite extensively to include Riverside camping with lots of shade trees.........see our News page on our web-site for up-dates. The website for this campground looks great, but believe me, it is not as it seems. The sites are very crowded, and they accept cash only! Has lots of seasonal campers and not very pleasant surroundings. The place is due for some upgrades. The campground sits just behind a quarry and is close to the main highway which was very noisy. We would not stay here. We camped at Glenview RV Campground in a Motorhome. This park offered very clean bathrooms and laundry areas. While the campground caters to seasonal sites, it was tidy and well kept. The ad reads river views and there was only one or possibly two sites with a view and one is a seasonal site. If the owners had been more personable we would have rated it an 9. We camped at Glenview RV Campground in a Travel Trailer. This was the worst campground I have ever stayed at. A few of us in our 20's went here and we were treated very poorly right from the start. The owner even went as far as asking us if we had drugs or anything drug related on us at the time. I believe this was due to our age. They have one medium-sized area to sent up your tent but I wouldn't think more than 3 tents could fit there. Don't plan on checking out the tent sites before paying for one...that is not allowed. The owner checked up on us more then any other family and we felt very uncomfortable. I would recommend going down the road a bit further and staying at the next campground on the water. You could not pay me enough to stay here again. We camped at Glenview RV Campground in a Tent. Don't believe the ads that they accept Visa. They only accept CASH; no checks either. Their Wi-Fi only works close to the office. Most of their sites are seasonal. Why someone would want to stay here all summer is beyond me. Don't believe them that the traffic noise stops at night. The campground is right next to Hwy 105 and trucks travel it ALL night long. We hardly got any sleep. (Wife used ear plugs.) We left the next day. (Owner was real upset.) Went up the road a few miles to a better campground. It's cheaper, nicer, wooded, has pull throughs and was so quiet. Will be contacting AAA and registering a complaint about Glenview. We camped at Glenview RV Campground in a Travel Trailer. 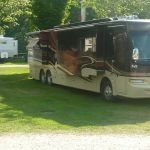 Are you affiliated with Glenview RV Campground ?